Wang Kexiang, a 65-year-old retiree living in Beijing, is addicted to nuts. Since he has a heart problem and the doctor has told him eating nuts is good for his heart, he eats them every day. What's more, he has also persuaded his entire family to join him in his munching habit. Now the household spends almost 500 yuan ($75) a month on nuts, around one sixth of his monthly pension. Among the various kinds of nuts available, Wang loves pine nuts imported from Brazil the most, saying they are bigger and better-tasting than domestic ones. That's why Wang was excited when he heard the news that there would be closer e-commerce cooperation among BRICS countries—Brazil, Russia, India, China and South Africa. "Currently, Brazilian pine nuts are sold here at a very high price. A very small bag could easily cost up to 50 yuan ($7.5). I am hoping I can buy more cheaper types in the future," Wang told Beijing Review. "That would be one of the concrete benefits for us ordinary people from closer ties among BRICS nations." Strengthening e-commerce cooperation was one of the eight major consensuses reached at the Seventh Meeting of the BRICS Trade Ministers in Shanghai on August 1-2. Others included more cooperation on digital networks at ports, services trade, intellectual property rights, investment facilitation and opposing protectionism. The consensuses cover every aspect of BRICS economic and trade ties, said Bai Ming, Deputy Director of the International Market Research Institute of the Chinese Academy of International Trade and Economic Cooperation. "They are interconnected and support each other, opening the next decade of BRICS cooperation," Bai told Beijing Review. As more and more consumers choose to make purchases online, e-commerce is enjoying mushrooming growth around the world. In China, cross-border e-commerce imports reached 1.2 trillion yuan ($179.3 billion) in 2016, up 33.3 percent from 2015, and the figure is expected to reach 1.85 trillion yuan ($276.4 billion) this year. The number of cross-border online shoppers surged 82.6 percent to 42 million in 2016, and is anticipated to hit 59 million this year, according to data from 100EC.cn, an e-commerce research institute. "E-commerce offers small and medium-sized enterprises an opportunity to directly participate in global trade with more diverse customers and tailored products," Bai said. "Presently, China's cross-border e-commerce platforms are growing by building warehouses as well as collection and distribution centers in foreign countries. But that's far from enough in terms of BRICS e-commerce cooperation," Bai said. "The domestic cross-border e-commerce network should be linked with the networks of other BRICS nations to create a larger cross-border network. China could use its experience to help them build their own cross-border e-commerce networks and then realize network linkage." Zhong Shan, China's Minister of Commerce, said Chinese people will soon see more food on their dining tables from Brazil, Russia, India and South Africa, following the e-commerce cooperation initiative adopted at the Seventh Meeting of the BRICS Trade Ministers. "BRICS ministers all think strengthening cooperation on e-commerce will boost trade, promote industrial upgrading, create jobs and help developing countries as well as small and medium-sized companies integrate into the global value chain," Zhong said at a press conference following the meeting. 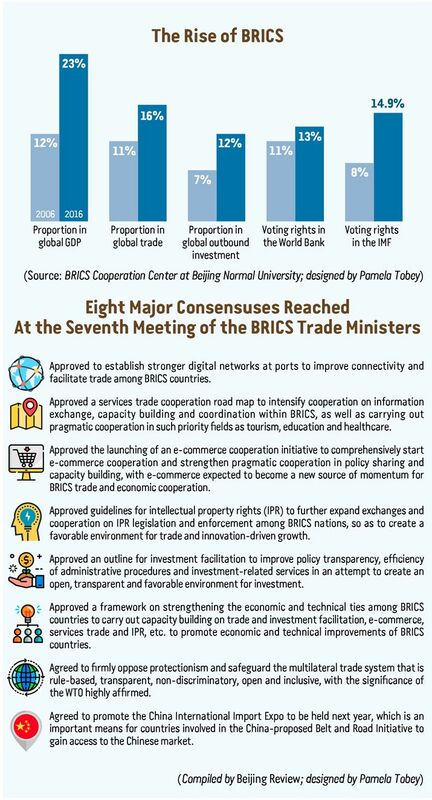 "Therefore, we decided to establish the BRICS e-commerce work group to start comprehensive cooperation and strengthen pragmatic cooperation in policy sharing and capacity building. It's expected that e-commerce will become the new momentum for BRICS trade and economic cooperation." A services trade cooperation roadmap was adopted at the trade ministers' meeting to boost economic complementarities and diversification. 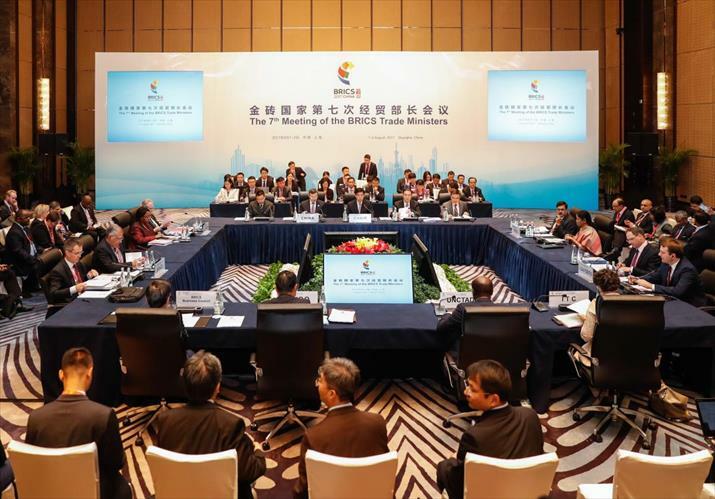 With the trade in services becoming a new driver for global economic and trade growth, the ministers decided to intensify cooperation on information exchange, capacity building and coordination within BRICS to make services trade a new highlight of BRICS trade growth. Although the group's combined GDP accounts for nearly one fourth of the global total, its export of services accounted for only 11.3 percent of the world total in 2015, according to data from the World Trade Organization. "Services trade is not only a strong driving force of global economic and trade cooperation, but also a precious opportunity for countries to balance their trade structure. It will also push forward the development of China's services industry and supply-side structural reform," Xu Hongcai, Deputy Chief Economist with China Center for International Economic Exchanges, told Beijing Review. Zhang Shaogang, Director General of the Department of International Trade and Economic Affairs at China's Ministry of Commerce, said services trade covers a wide range of sectors and BRICS countries have demand for cooperation in every one of those sectors. "As the first step in implementing the roadmap, we will carry out cooperation in the prioritized areas," Zhang said at the press conference on August 1. "The first prioritized area would be tourism, with Russia being a hotspot travel destination for Chinese, and tourist visits to India, South Africa and Brazil gaining more popularity." An Yongming, a retiree living in Haikou, capital of south China's Hainan Province, recently had an eight-day trip to Moscow and Saint Petersburg, which cost him a little more than 10,000 yuan ($1,500). "People of my generation have a very deep fascination with Russia and deep memories of the former Soviet Union. We grew up listening to stories about the Soviet Union and reading Russian novels. Russian, instead of English, was the foreign language some of the people of my generation acquired," An told Beijing Review. "Our minds are full of Russian names and places. I'd always wanted to visit the country." However, An thinks the local government has much to do to improve the tourist experience in Russia. 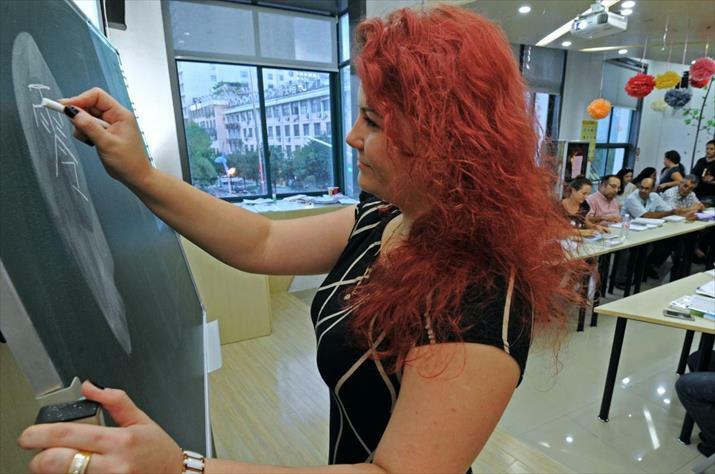 "Most Russians don't serve their customers. Drivers don't help passengers carry their luggage. There's no Chinese language service on the flight, although the plane is full of Chinese. There are no Chinese signs or even English signs in most tourist spots," An said. While he would still recommend people of his age to visit Russia, he thinks younger generations should visit countries with better tourist services. In addition to the tourism industry, Zhang said other prioritized areas include healthcare, computer and related services, research and development, business services, construction services, distribution and education. As the first achievement of the trade ministers' meeting, China and Brazil signed a two-year action plan on August 1, pledging to bolster collaboration in services trade. It would include project consultation, project construction, information technology, automation of banking services, travel, culture and traditional Chinese medicine. BRICS trade ministers also think investment is a key engine for global economic growth and job creation. In 2016, outbound direct investment from BRICS countries totaled $197 billion, but intra-BRICS investment accounted for only a meager 6 percent of the total, implying great potential yet to be tapped. In light of this, BRICS trade ministers adopted an investment facilitation outline. Zhong called it another major achievement in global investment policies and the first special document in global trade facilitation after the G20 guiding principles for global investment policymaking adopted at the G20 Summit in Hangzhou in 2016. The outline covers three areas: increasing transparency of laws, regulations and policies; improving investment-related administrative efficiency in BRICS countries by informing investors of approval results in a more timely manner; and enhancing the intra-BRICS investment cooperation level by establishing public-private dialogue mechanisms. Bai said intra-BRICS investment is limited because BRICS countries are at similar development stages, while cross-border investment requires the investment destination to be at a different stage. "For instance, if Chinese businesses want to invest in labor-intensive industries, they tend to choose Southeast Asian countries; if they want to invest in high-end industries, they would turn to the United States or some European countries," he elaborated. To make up for such shortcomings, his suggestion is that BRICS countries implement the trade facilitation measures adopted at the trade ministers' meeting. "Moreover, instead of using preferential policies to lure investment, BRICS countries should seek closer industrial distribution based on each other's industrial chains. Since we are less complementary to each other than we are to the United States and European countries, more cooperation is needed to unlock potential opportunities." Over the past 10 years, BRICS has evolved from an investment concept to a model of cooperation between developing countries. Their share in global trade has climbed from 11 to 16 percent and that in global outbound investment has risen from 7 to 12 percent. The bloc contributed 50 percent to global growth last year. However, all BRICS countries face economic challenges on various fronts. According to IMF data, the Indian economy expanded 6.8 percent in 2016, falling short of market expectations. South Africa witnessed a meager 0.3 percent annual growth the same year; Brazil's economy contracted 3.3 percent; the Russian economy shrank 0.2 percent amid fluctuations in bulk commodity prices and sanctions imposed by the West. China, whose economy expanded 6.7 percent in 2016, also faces the tough task of economic restructuring, with traditional competitive advantages such as low labor and land costs dwindling, as well as new economic factors not being fully explored yet. According to Bai, the steep fluctuation of bulk commodity prices in recent years hurts raw material-exporting countries in BRICS as well as importing countries like China. So a long-term, more stable relationship between exporting and importing countries is needed to achieve more balanced development for everyone in the group. "BRICS members need to do more to complement each other's weaknesses," Bai said. "For instance, China is a manufacturing powerhouse. If Chinese businesses carry out capacity cooperation with other BRICS countries to create local jobs and increase the added value of raw materials from those countries, we can establish an industrial chain in BRICS. When we participate in global distribution of labor, we can stop relying only on developed countries. With our own distribution of labor and our own industrial chain, we can reduce reliance on developed countries and increase economic security." Against the backdrop of rising protectionism, strengthening cooperation will help further increase BRICS member nations' voice in the global economy, Bai said. "They should aim to raise a collective voice in economic globalization and global governance on behalf of developing countries." Bai added.